It started with Colin Kaepernik‘s lone protest …. here is where we are at now! To display unity in light of President Donald Trump’s recent comments, the Pittsburgh Steelers stayed in their locker room when the national anthem was played Sunday at Soldier Field in Chicago. The Bears locked arms on their sideline. Kaepernick stands in a proud history of African-American athletes who have used their prominence to protest racism at home and unjust wars abroad. They have chosen to speak out at the height of their powers and in their prime money-making years. Often they have paid a high price personally, in their careers, their finances, their stature. And yet in the end, their sacrifice helped make this country better. Muhammad Ali opposed the Vietnam War and was prosecuted for refusing to be inducted into the armed forces, stripped of his title and barred from fighting. 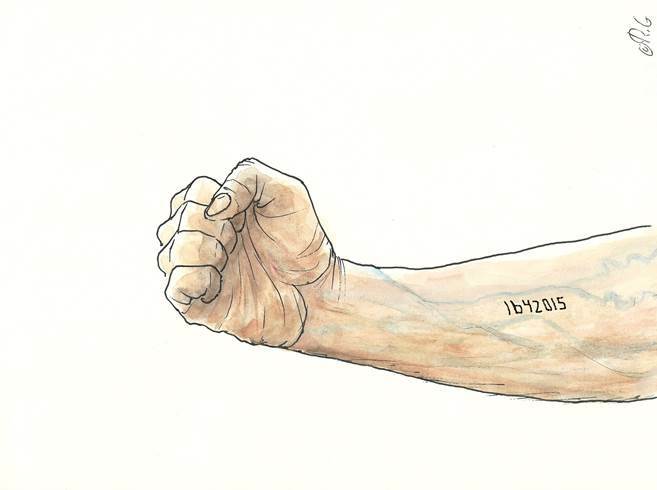 He lost some of the best years of his boxing life, but his protest helped build the antiwar movement that eventually brought that tragic and misbegotten war to an end. Colin Kaepernick, the former quarterback of the San Francisco 49ers, is being blackballed — itself a revealing phrase — from the National Football League with the collusion of the all-white owners. He is ostracized because a year ago he exercised his First Amendment right to free speech by taking a knee during the playing of the national anthem. Kaepernick isn’t hooked on drugs. He isn’t a felon. He hasn’t brutalized women. He is treated as a pariah because he protested the continued oppression “of black people and people of color.” He wanted, he said, to make people “realize what’s going on in this country. … There are a lot of things going on that are unjust, people aren’t being held accountable for, and that’s something that needs to change.” Born in Milwaukee, Wis., one of the most racially segregated cities in America, Kaepernick is particularly concerned about police brutality and the shocking police shootings of unarmed African Americans. Sports writers report that Kaepernick is loathed by the white owners and front offices, some of whom denounce him as unpatriotic. But what Kaepernick did — a dignified, nonviolent protest to raise awareness of a true and just cause — is the height of patriotism. It is the essence of democratic citizenship. No, Kaepernick is being treated as a pariah by the private club of white owners who are terrified of controversy. They clean up big time from public subsidies — tax breaks, public contributions to stadiums, television contracts — and they tremble at anything that might disrupt the gravy train. They want to make an example of Kaepernick as a way of teaching the rest of the players a lesson, hoping to keep plantation-like control of their players. Curt Flood, an all-star centerfielder for the St. Louis Cardinals, refused to be bought and sold “like a slave.” His protest and litigation cost him much of his career, but it broke open the owners’ control of players, opened the way to free agency and transformed baseball. “There I was, the black grandson of a slave, the son of a black sharecropper … a symbolic hero to my people. … The band struck up the National Anthem. The flag billowed in the wind. It should have been a glorious moment for me as the stirring words of the National Anthem poured from the stands. Perhaps, it was, but then again…. Colin Kaepernick stands in a proud tradition. For choosing to speak out, he has been shut out. The collusion of the owners not only violates antitrust laws; it tramples basic constitutional protections. The NFL owners should be called to account, not Kaepernick. 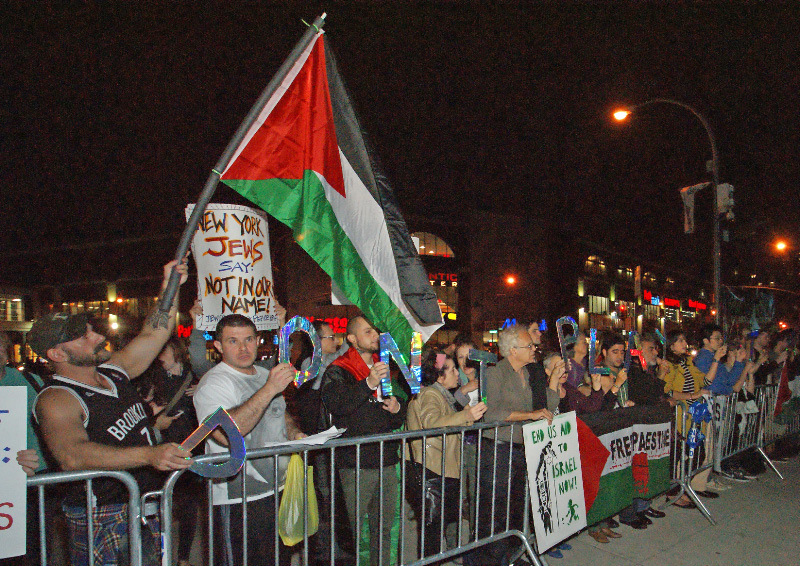 Rajoub wants Israel sanctioned because he believes that the travel restrictions and checkpoints, imposed by the Israeli government on the Palestinian Territories—not to mention the militarized separation of the West Bank and Gaza—has made the development of Palestinian soccer nearly impossible (this despite theirrecent historic qualification for the 2015 Asian Cup). Rajoub also plans on citing the detention and mistreatment of Palestinian national players by the Israeli Defense Forces, as well as the recent comments by Beitar Jerusalem coach Guy Levi, who said on the radio last month that their team would “never” sign an Arab player. The PA would need 75 percent of the 209 global associations, which is unlikely, but if it passes, Israel, in the words of Kamer, would see “all its international activities…come to a halt,” It would also be an isolating public relations nightmare for Netanyahu’s already beleaguered government. Just as the prime minister has been trying to get the stink of a highly racialized re-election campaign off his body, he has been under fire for the treatment by Israeli troops of Ethiopian Jews staging their own unprecedented #BlackLivesMatter protests against state violence. 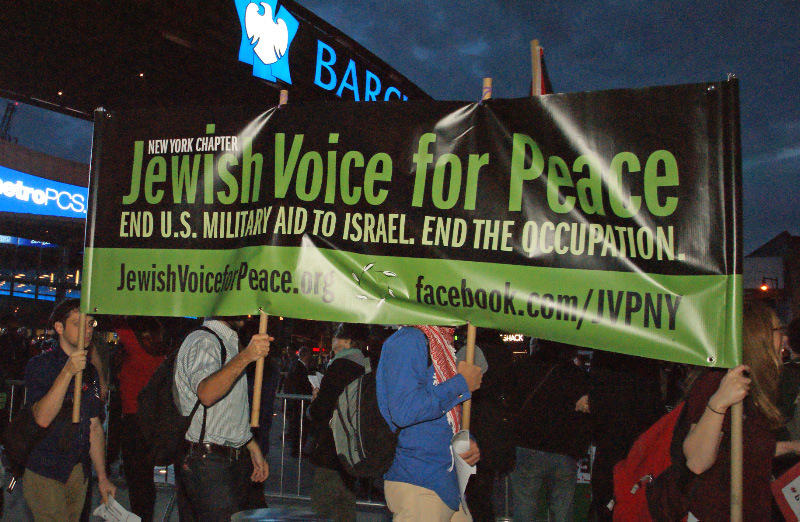 Israel and Netanyahu have also been waging a furious public relations campaign against the accusations of the Boycott, Divestment, and Sanctions movement that they are an apartheid country not unlike South Africa. 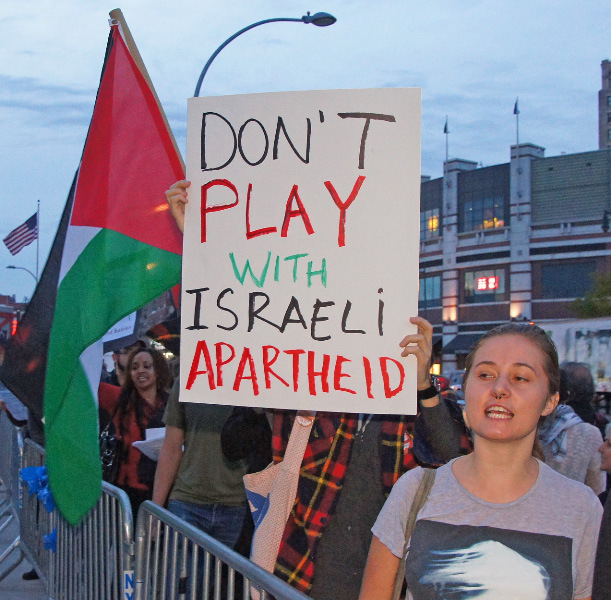 If FIFA suspends Israel, it would become the first country banned by the soccer federation since—yikes!—apartheid South Africa. In this case, the Israeli Football Association is saying, “Do not use sports as a way to argue for statehood. Sports is not the place for that kind of rhetoric.” The Palestinian FA is saying, “We can’t compete because the politics of the Israeli occupation makes developing soccer a near-impossibility.” This is a very tough argument for the Israeli FA to win. 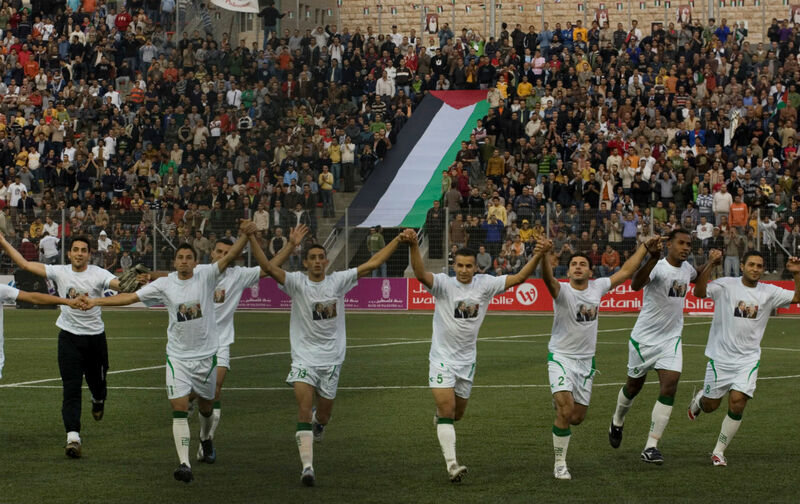 If sports and politics were truly kept separate, then the Palestinian Football Authority would be able to travel freely, receive foreign visitors, and enter international tournaments without the fear of not being able to show up. As I’ve argued here many times, attacking the ability of Palestinian soccer to develop is also about attacking fun, play, and hope. While the Palestinian FA has facts on their side, no observer expects them to win 75 percent of the vote. But if Blatter even prevents this from even being raised on May 29, it would be an ugly gesture from an ugly individual. FIFA is hardly a moral force in this world, but soccer certainly can be. It is the closest thing we have to a united global obsession that links every country. 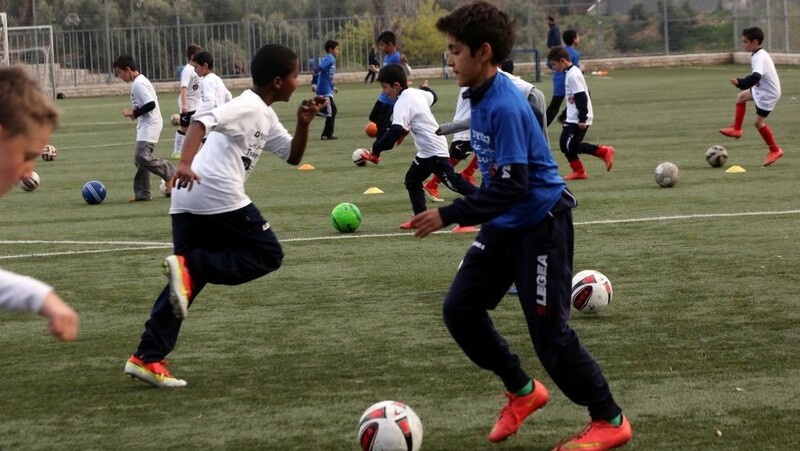 FIFA’s sole organizational obligation is to make sure that everyone has a chance to play. What worries Netanyahu is that discussing this issue in soccer then becomes like pulling a thread on a sweater. If soccer is warped by occupation, then what about education, healthcare, or basic staples of civil society? That’s a question the Israeli FA is now scrambling to see unasked. 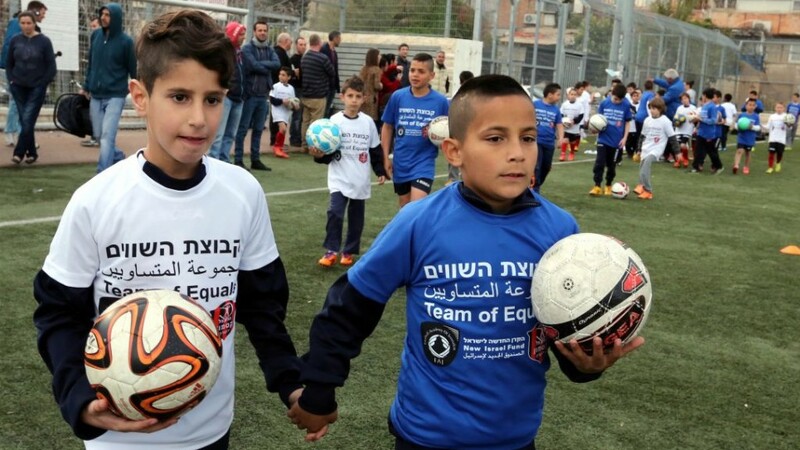 Two soccer academies — one from the Arab neighborhood of Beit Safafa and the other from the Jewish neighborhood of Katamon — partnered last month to create Team of Equals, a joint team bringing together soccer enthusiasts across the national divide. The children running slaloms through Hapoel Katamon’s soccer field in south Jerusalem would be indistinguishable from one another, were it not for the blue and white T-shirts setting apart Arab from Jew. Whether in Hebrew or Arabic, the children almost invariably said they rooted for Spanish club FC Barcelona and idolized its Argentinian forward Lionel Messi. 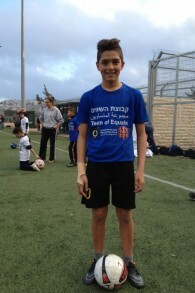 Ahmad Moussa Subhi, a sixth-grader from Beit Safafa, said he joined the team to meet new friends. He said language was no problem in communicating with his Jewish teammates, since he picked up Hebrew watching soccer and Israeli films on TV. “I like running and the sporting spirit,” he explained. Creating a binational team is far from simplein Israel’s capital. Beitar Jerusalem, the city’s largest team, is notorious for its fans’ anti-Arab chants. The Israeli Football Association fined the team NIS 40,000 ($10,000) in February after fans shouted racist slurs and spat in the direction of Hapoel Ironi Kiryat Shemona forward Ahmad Abed during a home game in Teddy Stadium. But Hapoel Katamon, a fan-owned club created in 2007, is meant to symbolize something completely different, said Shai Aharon, formerly the team’s star forward, who retired in 2014 to become its professional manager. Team of Equals was Aharon’s brainchild, born following an arson attack against a bilingual school in Jerusalem last November. Itzik Shanan, director of communications at the New Israel Fund, said his organization has been working to combat racism in soccer for over a decade, both by monitoring matches and writing reports on racist incidents, and by initiating educational activities such as Kicking Out Racism and Violence. NIF’s partnership with Hapoel Katamon has been ongoing for over three years, he noted, boosted by the club’s outlook on equality and partnership as values. Children at this young age are less infused with racial and political biases than adults, allowing true teamsmanship to blossom, he added. “They come from a very genuine, innocent place. I believe that adds a lot to the potential of this collaboration,” he said. For Salman Ammar, head of Beit Safafa’s soccer academy and a former player with Hapoel Jerusalem, endorsing the initiative was only natural. He had played in a Jewish-majority team his entire career and now sends his children to the bilingual school in Jerusalem. The tradition is as longstanding as it is powerful: fans and even players disrupting sporting events in the name of a greater cause. Sometimes when this takes place, it’s iconic, other times it’s forgotten. This is usually dependent on the power and breadth of the movements off the field that animate these extraordinary actions. We saw it most famously perhaps when John Carlos and Tommie Smith raised their fists at the 1968 Olympics. It helped change the world when the people of Australia and New Zealand fans stormed the grounds when Apartheid South Africa’s storied Springbok rugby team took the field. 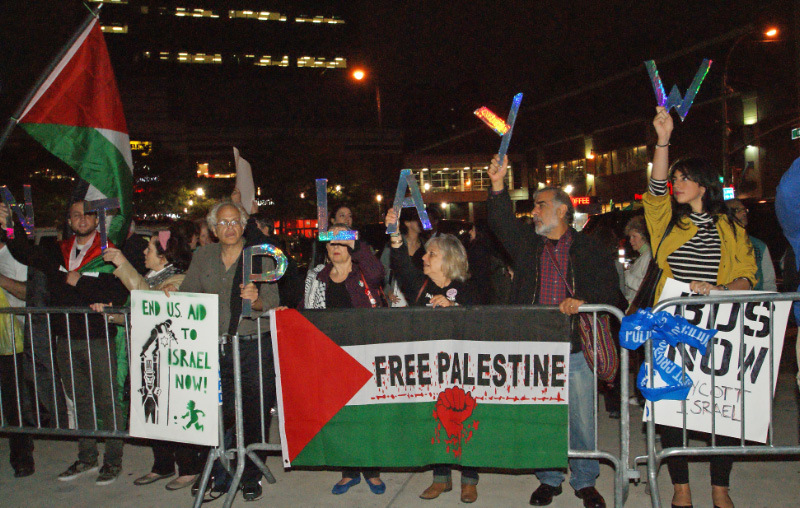 It continues today when people protest the Israeli basketball tour of the NBA preseason in the shadow of the Gaza war or when NFL players in solidarity with the family of Michael Brown raise their hands as they leave the tunnel. That tradition continued last night when, as a part of #FergusonOctober, fifty people in the upper deck of the St. Louis Rams-San Francisco 49ers game unfurled a banner saying “Black Lives Matter On And Off The Field” and held a protest right in the middle of Monday Night Football. Sorry to inconvenience the 3rd quarter, but the wild cheering of African-American athletes who can run fast, and the death and disrespect of Mike Brown simply cannot be separated from each other. Black lives must matter on AND off the field. We witnessed many hateful, hostile, and nearly violent responses from fans inside and outside the stadium. But we witnessed many Rams fans – including many white fans — who joined our protest in solidarity after initial hesitance. It’s almost like they needed permission to show their justifiable outrage. Last week the St. Louis Symphony protesters asked ‘What side are you on, my friends. That’s the question. There are six witnesses, no police incident report, still no arrest, and Mike Browns in every town. This is real basic. There can be no fence-sitting here. Dismantling the Blue Wall of Silence also includes ending white walls of silence. Yes, it’s true that ESPN ignored the happenings in the stands. But it was picked up by mainstream channels like The Sporting News and SB Nation as well as the highly trafficked rebel sports site Deadspin. At a rally this weekend, Montague Simmons, from the Organization for Black Struggle, told a crowd: “They didn’t value Black lives then, they don’t value Black lives now…. If this moment is gonna be all that it can be, we got to make the cost of Black life too high for them to take it.” Actions like last night are a critical part of that process. 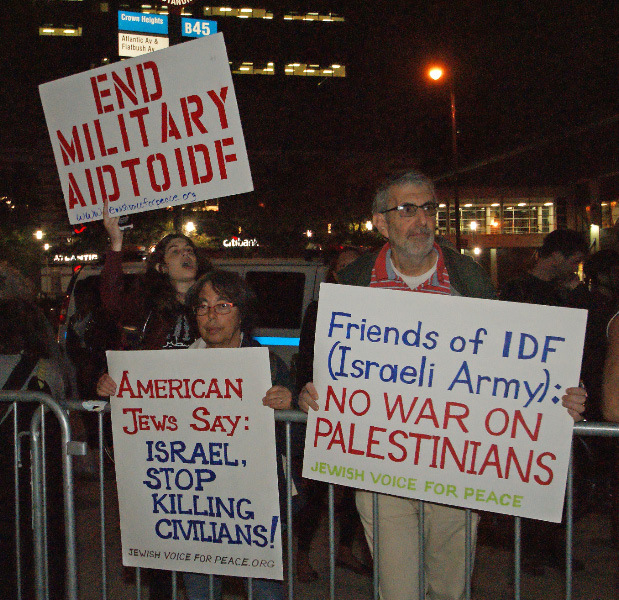 IN PHOTOS ~~ APARTHEID AND WAR ARE NOT GAMES! 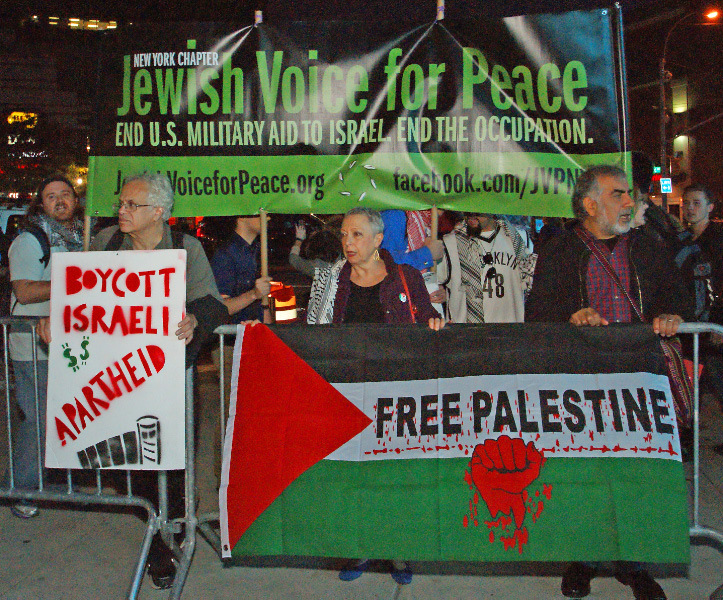 BOYCOTT ISRAEL ON THE COURTS!! 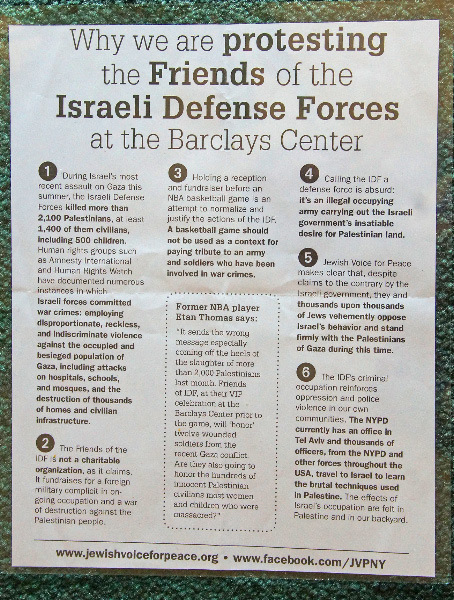 When activists arrived at the Barclays Center in Brooklyn to protest a Friends of the Israeli Defense Forces fundraiser that was coupled with an exhibition game between the Nets and Israel’s Maccabi Tel Aviv, the police were waiting with a message of their own. As the night unfolded, this message spoke volumes. 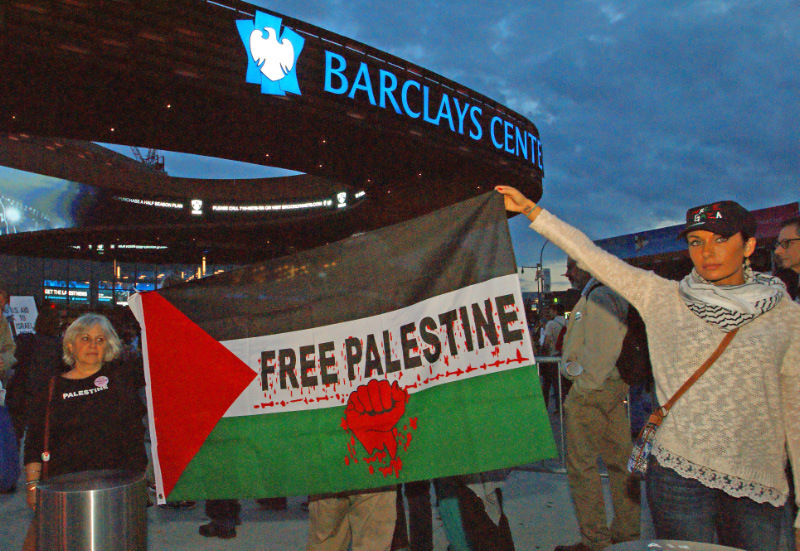 Protesters would not be allowed on the expansive plaza that unfolds from the front of the Barclays Center all the way to the Atlantic Yards subway entrance. Instead, they would have to be in a fenced-off pen on the narrow strip of sidewalk to the side of the arena. Yes, an outdoor space built with public funds was deemed a privatized, no-free-speech zone, enforced by armed public employees, otherwise known as the police. We are seeing right now in Brazil the ways in which the glories of soccer are being used as a cover to displace people from their homes and crush popular resistance. In Gaza and the West Bank, we are seeing the opposite: the ways in which the hypnotic flair of the beautiful game can make an oppressed people ready to face another day. When we speak of the great “droughts” in sports, our minds drift toward baseball’s Chicago Cubs, the NFL’s Cleveland Browns and hockey’s star-crossed Toronto Maple Leafs. Yet there has never been a more harrowing athletic drought—rife with pain, pathos and perseverance—quite like that of the Palestinian national soccer team. This is a national team without a recognized nation to call home; a national team that has never qualified for a major international tournament; a national team that, like its people, struggles to be seen. That drought, eighty-six years in the making, is now over. Founded in 1928, the Palestinian national soccer team has for the first time won the Asian Football Confederation Challenge Cup. Following its 1-0 victory over the Philippines, the Palestinian team will now play in the Asian Cup 2015, qualifying for a major international tournament for the first time in its history. Graffiti transformed the lower part of the wall into a spray paint script: “More bridges, fewer walls”; “Make hummus not walls” and, “In my previous life, I was the Berlin Wall. The beer was better there.” The wall’s humor and wit dulled my sadness. I ran on. She Runs: The author warms up in Bethlehem before the race. 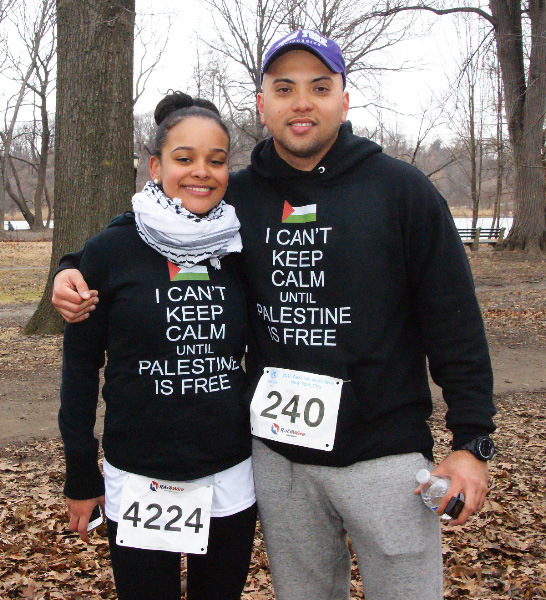 Race Day: As many as 3,200 runners took part in the second annual Palestine Marathon in Bethlehem on April 11. 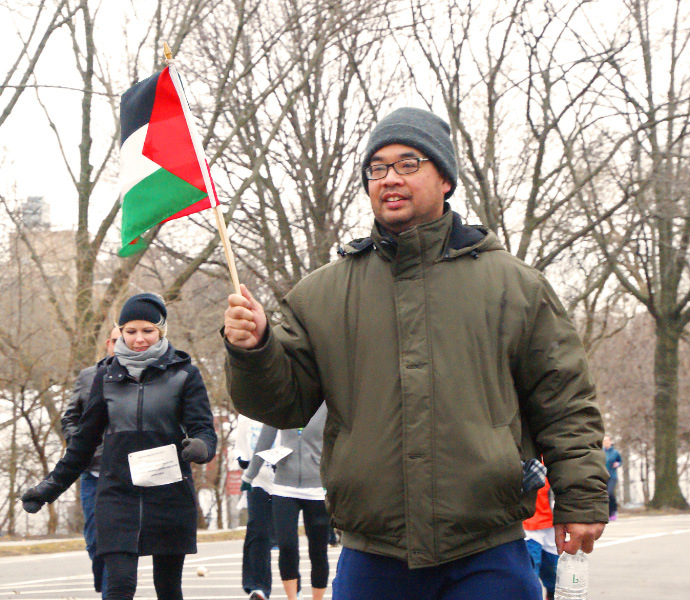 Like me, Nguyen and her husband, Moshe Saraf, were headed to Bethlehem to participate in the second annual Palestine Marathon. Unlike me — I’m a Canadian tourist — they are Israelis, and it’s illegal for them to be there without a permit. But since Nguyen is involved with an organization that links Israelis and Palestinians, she’s familiar with the trip home. I, on the other hand, was a little nervous about our destination. This was my first time in the West Bank. I’d been to Israel before, but this would be the first time I’d be seeing the separation barrier. Safety was also on my mind. I swallowed my fear, and asked Nguyen about her thoughts on peace. “Peace begins on a ground level,” she said. I had made the trip so that I could witness and report what I saw. 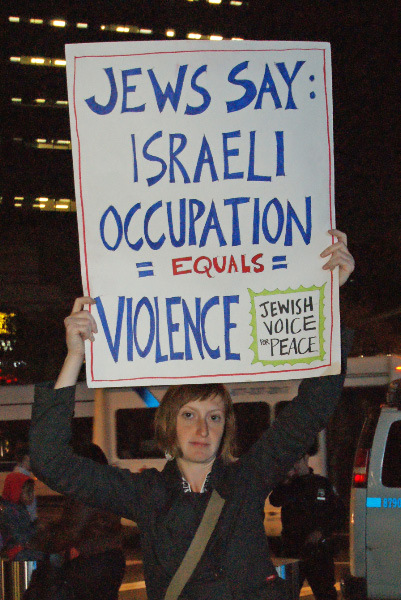 But as a Jewish journalist, the task was a little loaded. I was there to understand those on the other side of the wall. My journey started three weeks earlier, when I joined a press trip to run the half at the Jerusalem Marathon. We toured the country and ate incredible food. Then we strapped on our sneakers and ran the hilly course, which passed Israeli highlights like the Knesset, the Zion Gate and Mount Scopus. 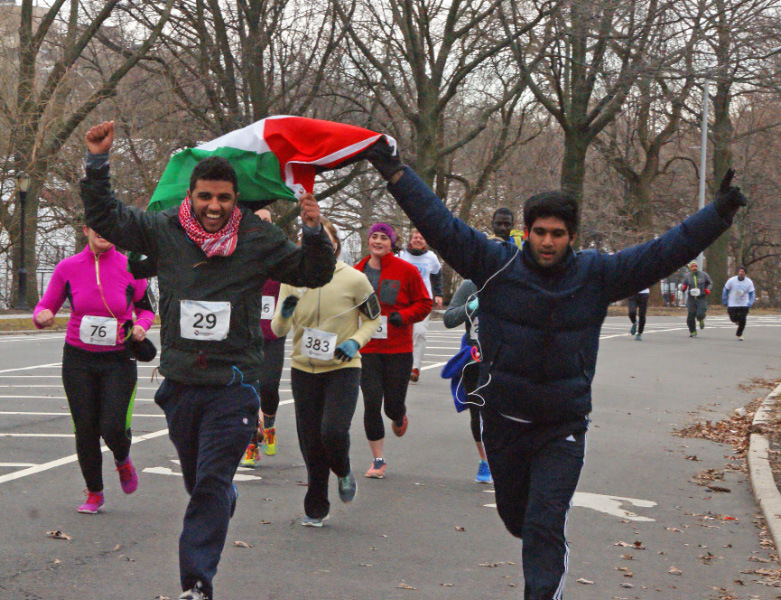 More than 25,000 runners from 54 nations participated. Many of them raised funds for projects and charities. 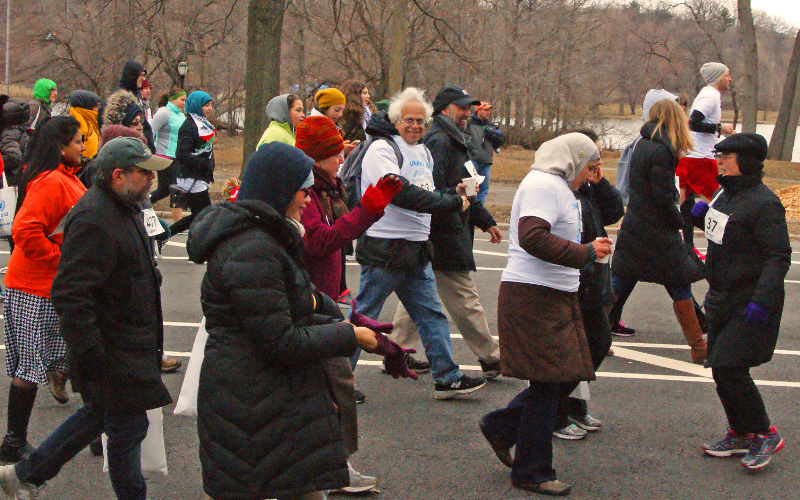 During my 13-miles race, I met runners from many different backgrounds, including a settler, Christians and Orthodox Jewish women. 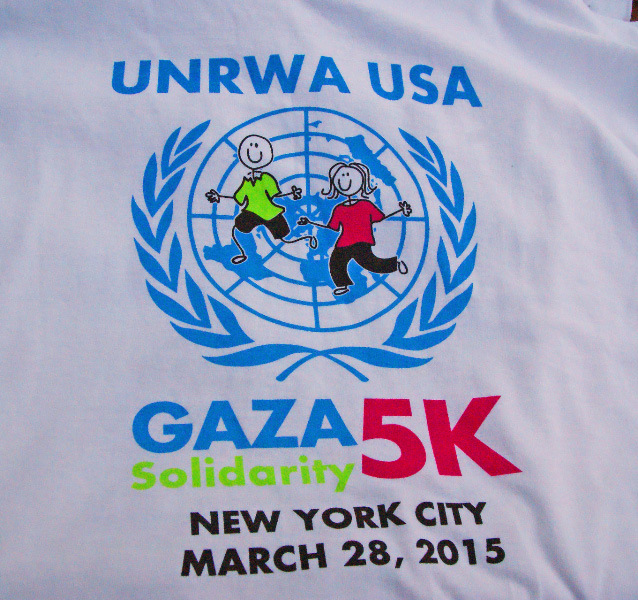 But I didn’t meet any Palestinian or Palestinian-Israeli runners. I felt like I was missing part of the region’s running story. So here I was, set to run the same distance. This time, I’d be the minority in unfamiliar territory. 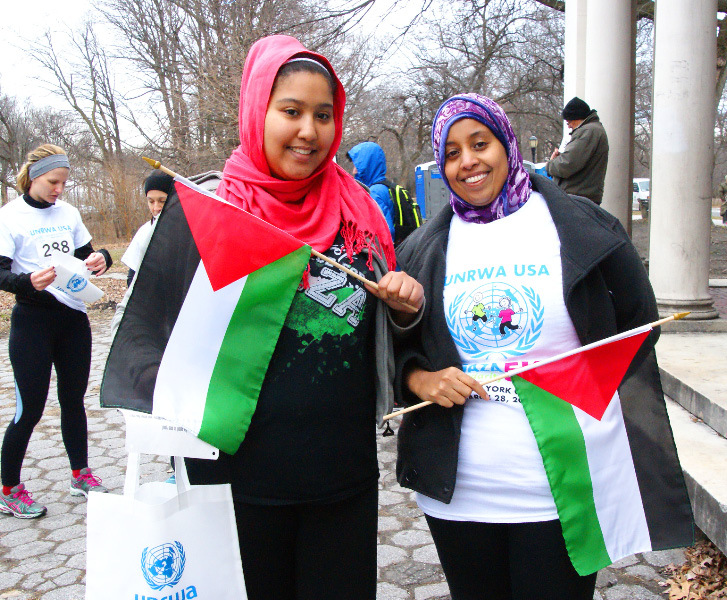 The first Palestine Marathon launched last year, weeks after the United Nations Relief and Works Agency canceled the Gaza Marathon when Hamas banned women from running. 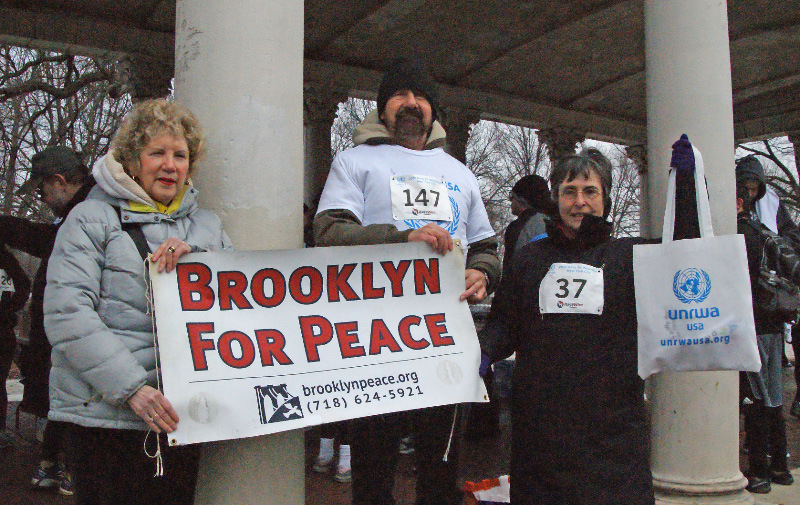 In 2013, 650 runners participated. 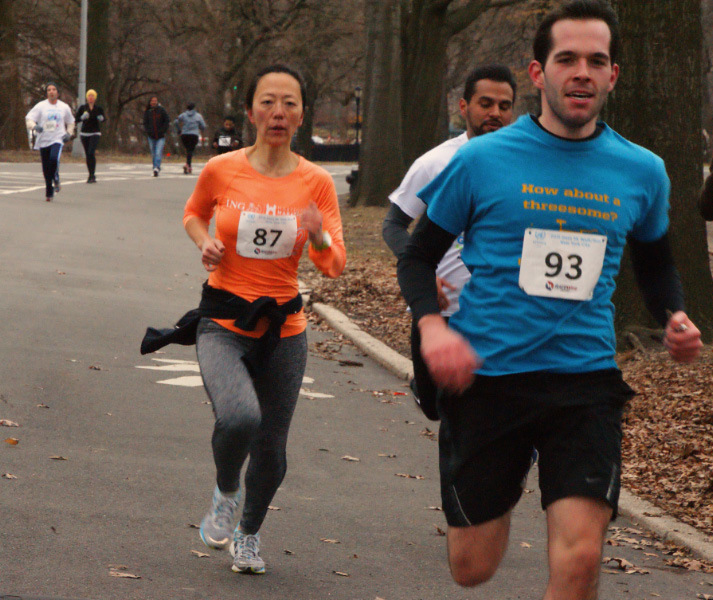 By the time I collected my registration package in April, 3,200 runners were expected. 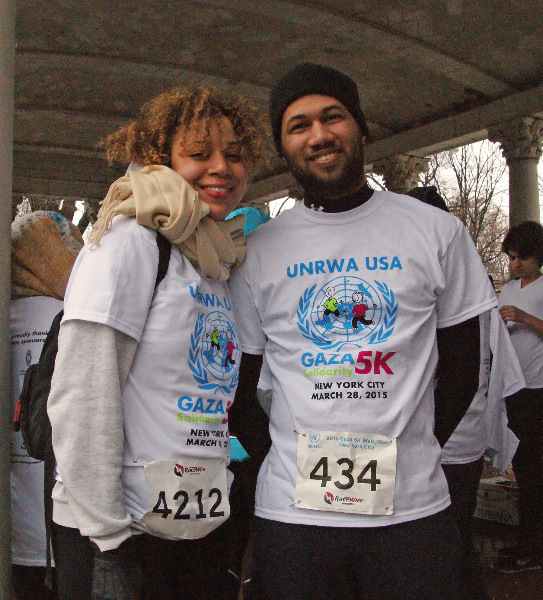 Days before the race, news agencies reported on the Gaza-based Olympian who was barred from participating. 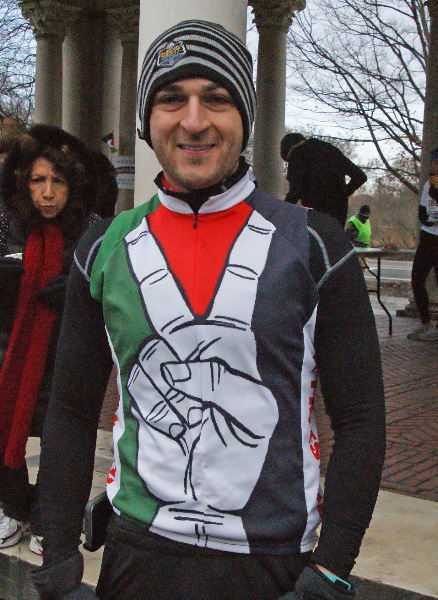 The Olympian was among a group of runners denied travel permits out of the Hamas-ruled territory by Israel. Israel considers Hamas a terrorist organization because of the hundreds of Israelis killed by its attacks. 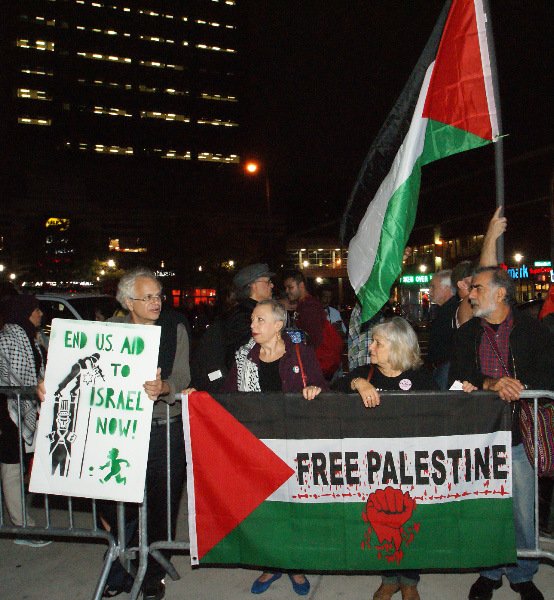 As a result, most of the population cannot travel beyond Gaza’s borders. 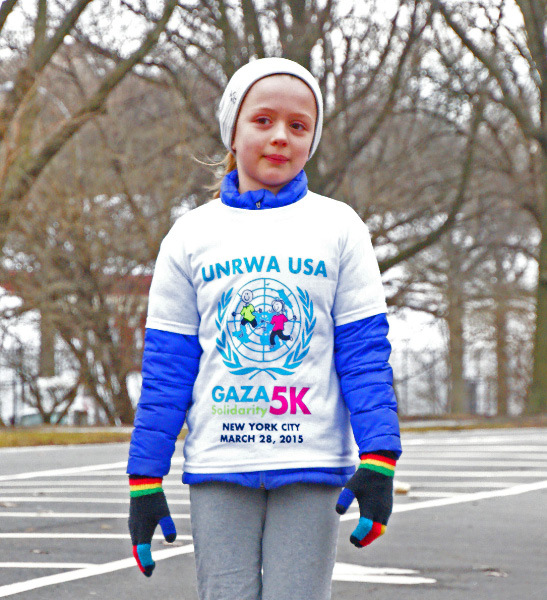 It’s restrictions like those that led a Danish aid worker to come up with the marathon idea. 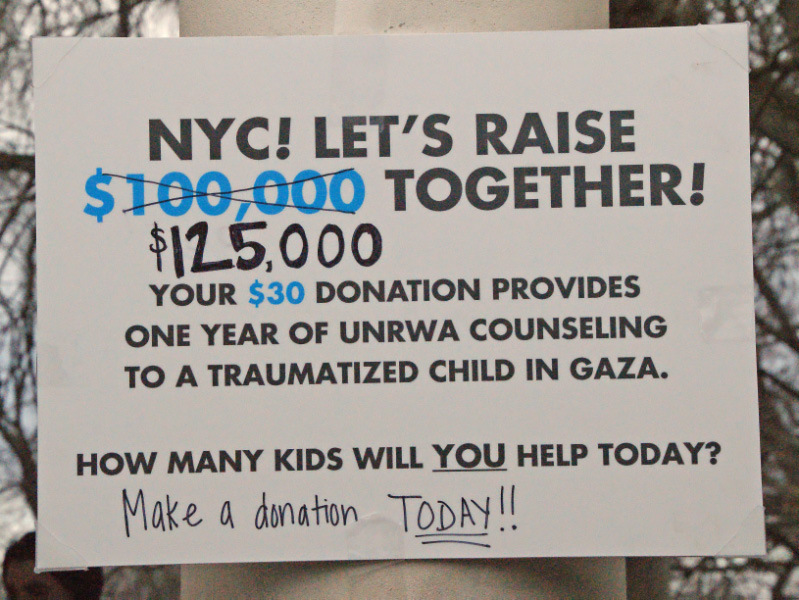 “The idea came to me one day, as I was waiting in a checkpoint. 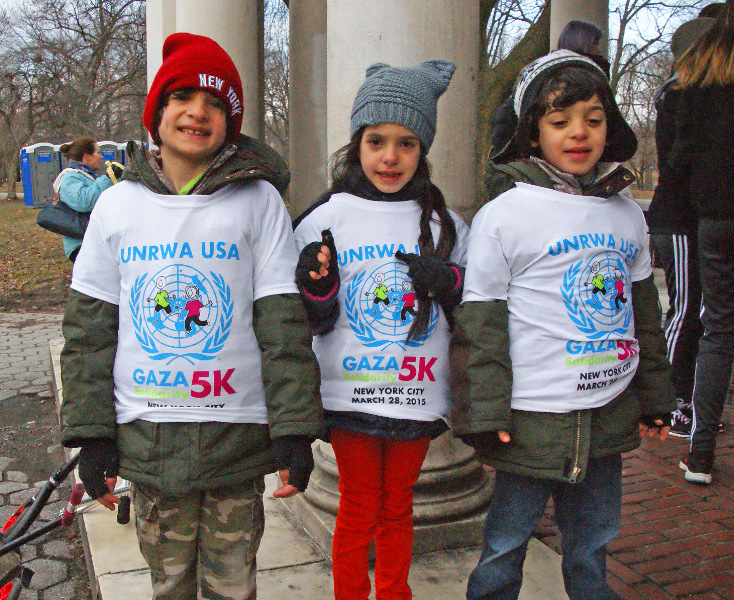 Palestinians’ inability to move was what struck me the most,” said marathon co-founder Signe Fischer, who works for the Danish foreign ministry. 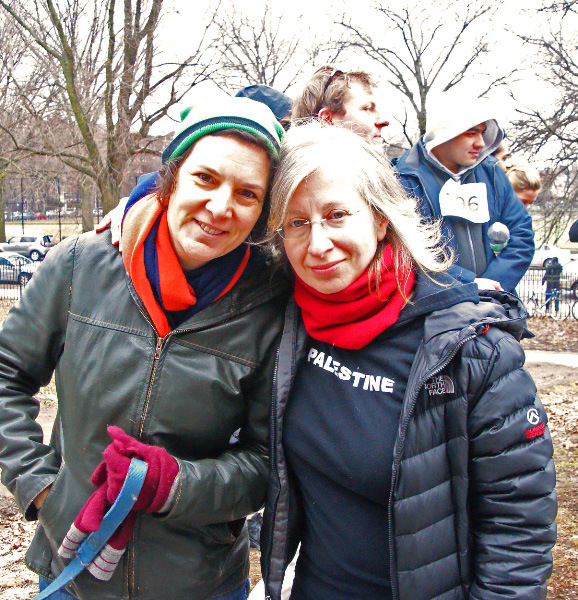 She also co-founded the Right to Movement organization. 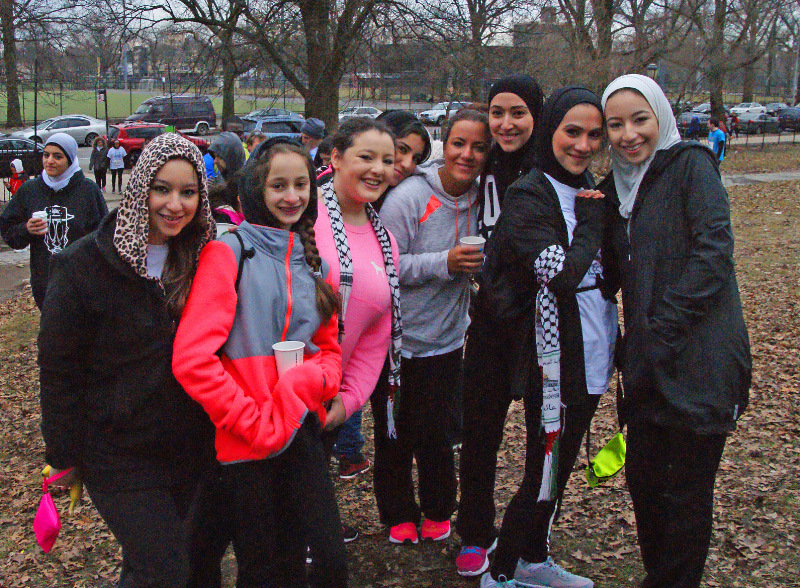 Fischer teamed up with Palestinian organizations and municipalities and created the first marathon with a focus on free movement for all people. A documentary film crew caught this scene and others leading up to last year’s race. I watched the film the night before the race, in Bethlehem’s Manger Square, in the shadow of the Church of the Nativity and the city’s only mosque. When the movie finished, runners scattered in the cool air to find warm beds. We were due back in the square — the race’s start and finish point — in a few hours. I needed to find Fadi Asiwat. Asiwat was a 24-year old swimming coach and my home stay host. 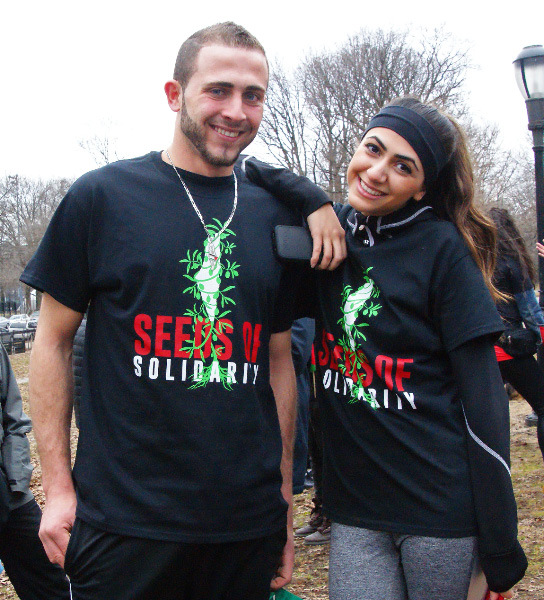 We met on a Facebook page for runners in East Jerusalem. When I posted to the page, asking about good places to stay, he offered a room. He was also running the half marathon the next morning. As we drove to his home, Asiwat told me that before the wall, the drive to Bethlehem was less than 10 minutes. Twenty-five minutes into our ride, we crossed to East Jerusalem from the West Bank with a nod from the checkpoint guards. Asiwat said my fair skin and blue eyes probably helped us avoid a time-consuming check. In my room, a fruit basket and a bowl of nuts awaited. “Arab hospitality. You are always welcome,” Asiwat said, And with that, he wished me a good night. The next morning, Manger Square was bursting with energy. 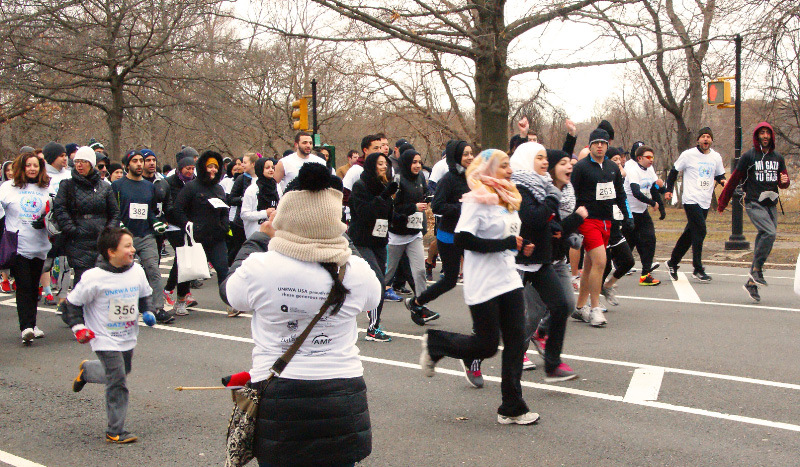 Top 40 hits played loudly, as Danish girls in tank tops warmed up alongside women in hijabs. Young Palestinian men danced in a circle, shaking their shoulders in unison. Runners smoked cigarettes while stretching. “Why are you here?” I asked the runners around me. Soon all the runners were ushered to the starting area. A horn blasted. We took off. 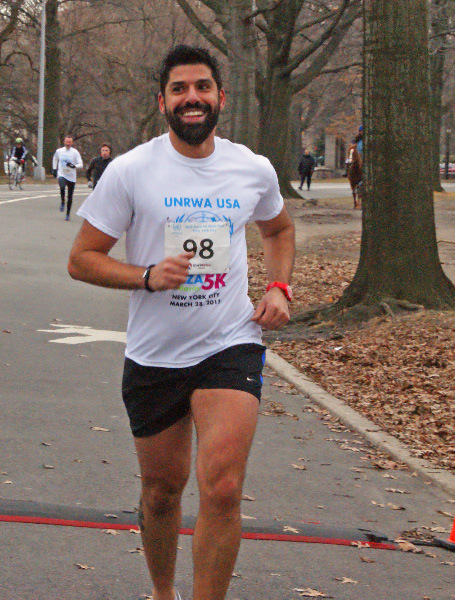 My motto for running the Jerusalem half marathon was “Inch by inch, it’s a cinch.” Applying the motto once again, I slipped into a gentle stride. The route first ran through the Aida refugee camp, which was established around 1950 by Palestinians from the Jerusalem and Hebron areas. Today, Aida is home to more than 4,700 people. 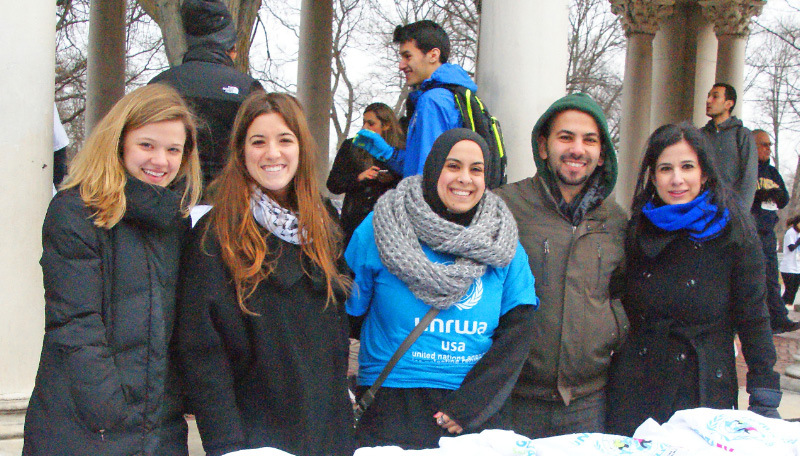 UNRWA reports that it is severely overcrowded. It is here that I first came face to face with the wall. Israelis call it the “security fence” and say it has resulted in fewer suicide bomb attacks. Palestinians call it the “apartheid wall” because of the impact it has had on their day-to-day lives. Regardless of its name, it’s imposing. With 26 feet of gray concrete, its purpose is unequivocal: to keep people contained and controlled. As I rounded a corner, an even taller tower loomed. At its top, small dark openings were visible. They were just the right size for the tip of an automatic weapon to follow, aim and fire. Immediately I was hit with sadness. I understand the Israeli desire for freedom from attacks, but I also was beginning to understand what it’s like to live under the physical threat of violence — and restriction — every day. It fosters a climate of distrust. After a loop through the Aida camp, we took a long stretch along Hebron Road. Young boys trailed me on their bicycles, yelling, “Yalla! Yalla!” I ran past a donkey munching on hay, men drinking tea, and fields of olive and fig trees. Groups of children extended their arms for high-fives. In the South, we passed another refugee camp. Dheisheh was initially built as a temporary shelter during the 1948 war. Today, multiple generations know it as their only home. The six mile mark was in al-Khader, where the wall divides portions of farmland. Farmers were left unable to access parts of their land without a permit. Protests are ongoing. During the run, Palestinian boy scouts handed out orange slices. I rounded the turning point and headed to the finish line. Once I crossed, I collected my olive wood medal and stood shoulder to shoulder with hundreds of other runners. I reflected on the race, stretching while inhaling the cigarette smoke. After watching some more celebratory dances, I headed home. On the way back to Israeli territory, I followed Palestinian men and women weaving through metal detectors and turnstiles at the more extensive checkpoint. After a brief interview with an Israeli guard, I was on the bus back to Jerusalem. Soon I’d be having Passover dinner with my cousins in Jerusalem. These are relatives who served in the Israel Defense Forces, who build houses with safe rooms. In a few days, we would be gathering around the table to tell the story of enslavement and freedom. Freedom would be on my mind. So would walls — for what they protect and what they conceal. It’s about my family on one side, and the people I met on the other. And my freedom to see it all with the worn-out soles of my sneakers. Tania Haas is a freelance journalist travelling the world and reporting on what she sees (and eats). Her work has been featured in Bloomberg News, CTV News Channel, The New York Times and USA Today. Sports represent escape, joy and community, and the Palestinian national soccer team, for a people without a recognized nation, is a source of tremendous pride. To attack the players is to attack the hope that the national team will ever truly have a home.